Anh Volcek was born in 1975 while her family was stranded in the middle of the Pacific Ocean on a ship named “The Forever Young”; they were eventually rescued with the help of the Queen of England. Anh grew up as a Danish citizen in Quebec City and Montreal, where she fell in love with fashion with a European flair. After graduating with honors from Parsons School of Design and winning a gold thimble in 1998, Anh began designing costumes for modern dancers with InMixedCompany in New York City. There, she was able to utilize her knowledge of construction to best showcase a dancer’s motion lines. In Paris, Anh learned intricate and old world draping techniques from a patternmaker who worked for Dior and Louis Vuitton. She then went on to fine tune her design knowledge while working for couture houses such as Koji Tatsuno who was backed by Yohji Yamamoto, and later for Lapidus. Following a career with large US designers in New York and California such as Calvin Klein, Nautica and Gap, Inc, Anh Volcek set forth to establish her own company in 2009. Basing her knowledge of construction and body movement, the styles exemplify clean lines and fluidity. French for “one,” L’une is about becoming one with your clothes. Recently featured in Riviera Magazine on their style radar and in 944 Magazine under Top 9 picks, Anh Volcek has become a designer to watch. 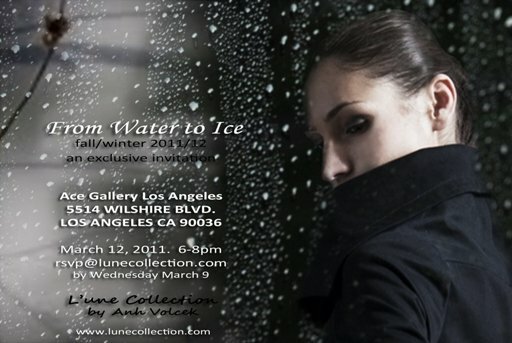 Anh Volcek will present her Fall/Winter 2011 L’une Collection “From Water to Ice” on March 12th, at Ace Gallery in Los Angeles as part of L.A. Fashion Week. “From Water To Ice” is a very personal journey into Anh’s life. Water represents her birth at sea on a ship while her family was escaping the war in Vietnam. Ice represents her pain when she was abducted for one year at the age of 8 by someone who was mentally ill. The styles hark back to water, for when she allowed herself to cry and finally feel human again. Fall/Winter silhouettes are a blend of military and Asian. The collection is about contrasts of textures from flat jerseys to sequins to hard gems. The lines are inspired by the soft ripples of waves to structured lines representing ice. Adapting a technique of melting plastic she learned while working in Paris, Anh Volcek delivers some new designs with oversized 4 to 8” sequins. next post: Charlie Sheen Fired. So Much For Winning. Thank you for the wonderful article Hilary! 53 queries in 0.616 seconds.